CHAMPAIGN, Illinois — It’s dinner time on a Tuesday in October at a popular dining hall at the University of Illinois at Urbana-Champaign, its flagship campus. Hungry students line up, swipe their ID cards and swarm the buffets. At the end of one counter, there’s an impressive display of dishes that look a little different from the typical college fare of tacos and pizza: plates of Silverfin Sliders topped with a fresh vegetable slaw called “chow chow.” Students can also choose smoked Silverfin with green tea on rice or fried Silverfin topped with mixed greens. 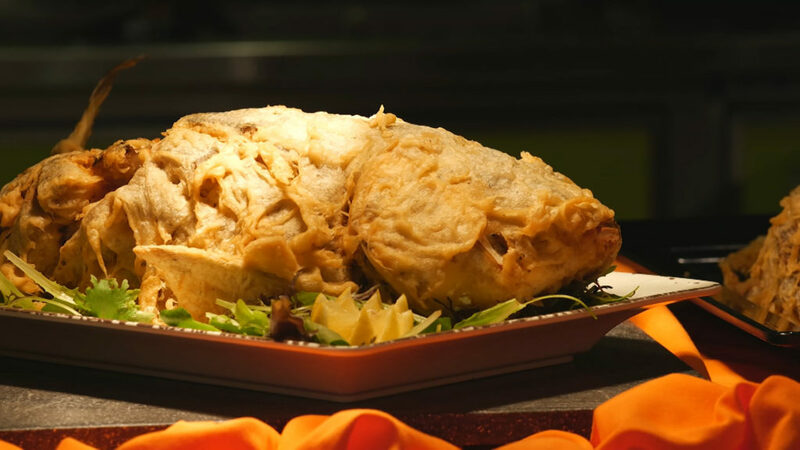 Whole-fried carp is one of several recipes used for the dining hall. It turns out “Silverfin” is another name for Asian carp, an invasive species wreaking havoc in lakes and rivers across the Midwest. And this Silverfin smorgasbord is a part of Illinois’ novel efforts to battle back the fish, which are now within 50 miles from entering Lake Michigan. The carp have been slowly making their way up through the Mississippi watershed since they were first brought to the U.S. as pond cleaners in the 1960’s. Bighead and Silver carp can grow to over 100 pounds, decimate native fish populations and are infamous for their wild jumping when startled by loud sounds, making boating in infested waters dangerous. During her term, which ended this earlier this month, Sanguinetti helped oversee the state’s efforts to eradicate the carp and keep them out of the Great Lakes, which include raising awareness, monitoring the population and fishing as many out of the Illinois River as possible. For its part, the federal government has a large electric barrier about 25 miles outside Chicago and is planning even more defenses. 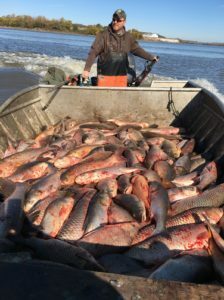 The state’s contract fishermen have pulled round 7.5 million pounds of carp out of the Illinois River since 2010. But their catch isn’t for human consumption. Most of it is made into fish bait, fertilizer and pet food. There’s never been a market for Asian carp as food because Americans don’t generally think of it as suitable for eating. The University of Illinois wants to change that. Smith says the school is the first institution to dish up Asian carp on such a scale. 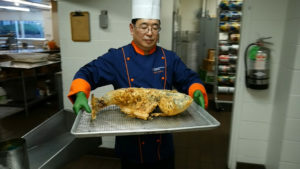 He’s serving between 9,000 and 11,000 pounds of Asian carp in his dining halls every year, most of it provided by private processors and fishermen in central and western Illinois. He says Asian carp isn’t the only “underloved” fish he serves. Other species include cape shark, Acadian redfish and the invasive Chesapeake blue catfish. SooHwa Yu, the chef in charge at the dining hall, says it’s unlike any other fish he’s worked with before, in part because it’s extremely bony and difficult to cook. “The only way you can do it is to deep fry, steam it or smoke it,” says Yu, who’s come up with several recipes for the carp. One of the most popular is the Silverfin sliders in the dining hall today. For his Cantonese-style Silverfin, he deep fries the entire fish, and sometimes carves it right in front of the the students.. He points out that the university has a large international student body, many already used to eating fish bone-in. The carp were caught the day prior by Clint Carter, a commercial fisherman and owner of Carter’s Fish Market in Springfield, Illinois. The market’s been in Carter’s family for decades, though these days, it sells mostly imported and frozen fish. Carter says he’s seen how the Asian carp have decimated native species, “wrecking” sportfishing in the lakes and rivers of central Illinois, and helping speed the decline of the local fishing industry. Carter’s made it a personal mission to help grow a market for Asian carp in the U.S.
Carter has a plan to buy his own small fish processing plant, and in the meantime works with the few processing facilities in western Illinois venturing into the Asian carp market. He gives Asian carp cooking demonstrations, teaches the chefs at the University of Illinois how to clean and gut the fish, and is trying to get other universities in the Midwest interested, too. Carter’s also partnering with Chef Philippe Parola in Louisiana, who is leading his own campaign to promote eating the carp by from the other end of the Mississippi basin. Parola’s been speaking out for years about the risks that Asian carp pose to the shrimp, oyster, crab and crawfish populations of the Atchafalaya basin. “There’s no more playing around with this, says Parola. “The only solution is commercial harvest.” Parola’s developed a whole blueprint to reduce the carp population by eating them, including his own recipe for a Silverfin fish cake, which he’s marketing to large institutions like universities. And it seems to be catching on, at least here at the university. This article has been updated to more accurately describe Chef Parola’s blueprint.